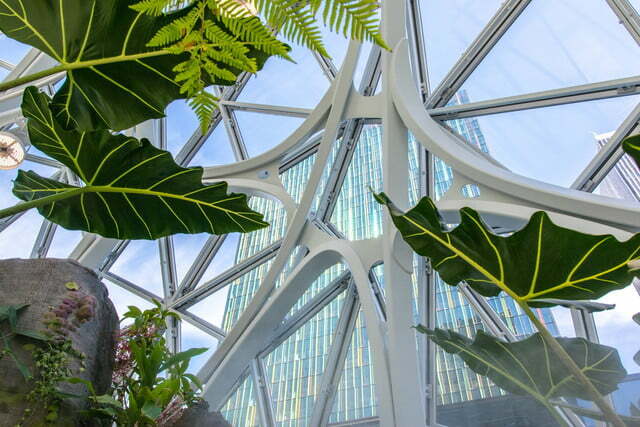 There’s an area of downtown Seattle where you can’t help but notice them: Three conjoined circles that look like bubbles shimmering in the sun, or perhaps the sac of an alien life-form about to burst forth. Either way, it’s a reminder that you’re in Amazon town. 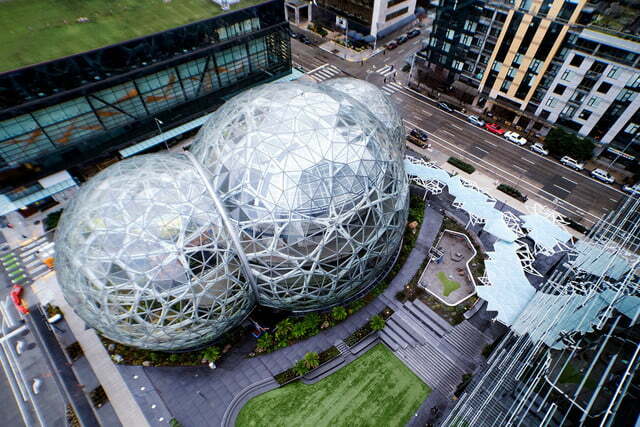 The Amazon Spheres may have just opened the greenhouse-like space to workers (“Alexa, open the Spheres,” is how CEO Jeff Bezos put it), but Seattleites have been watching the construction of what locals call “Bezos’s Balls” since 2015. 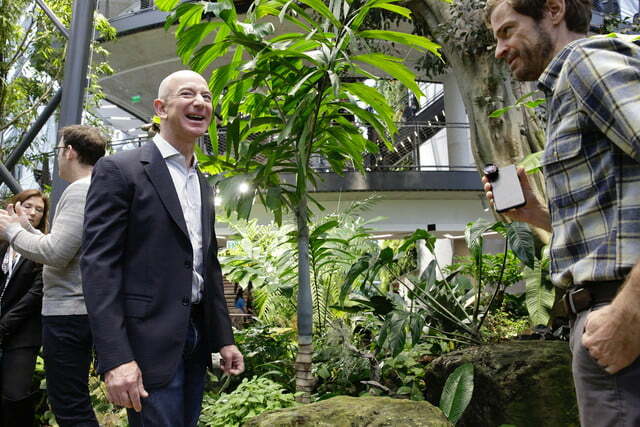 Amazon is hoping the pseudotropical environment will inspire creativity in its employees. 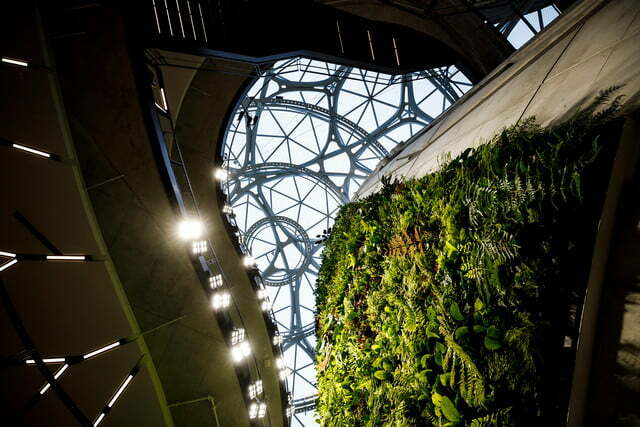 The workspace has waterfalls, a river, and living walls that house over 25,000 plants and freshwater animals. 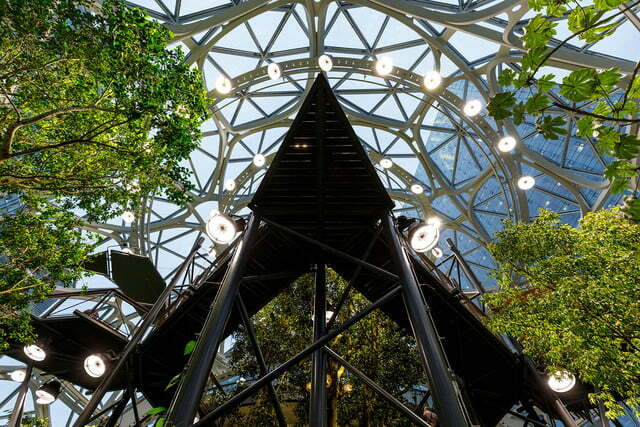 Employees who want to think outside their cubicles can schedule some time in a treehouse meeting room. Some of the seating looks more like what you’d find by a pool than in an office. There are a few spots to grab a quick snack, and the cashier-less Amazon Go store is steps away. Later this year, James Beard-award-winner Renee Erickson will open a bar and restaurant in the structure that will be open to the public. 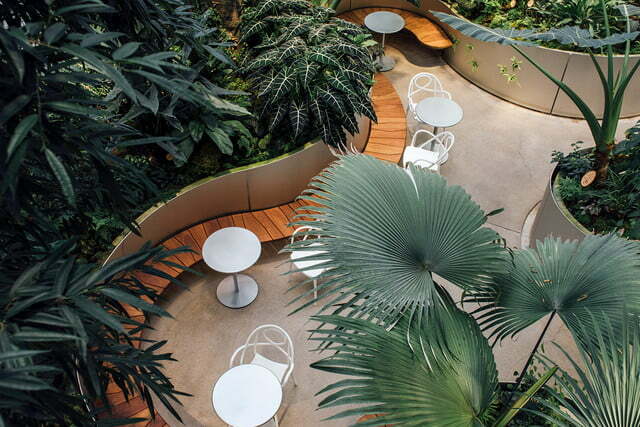 NBBJ designed the steel, concrete, and glass structure, which houses 400 species of plants from 50 different countries. 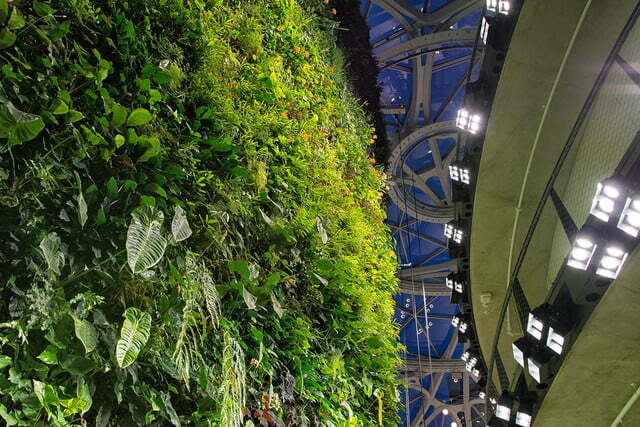 Many of the 40,000 plants are found in cloud forest ecosystems, which are typically cool and humid. 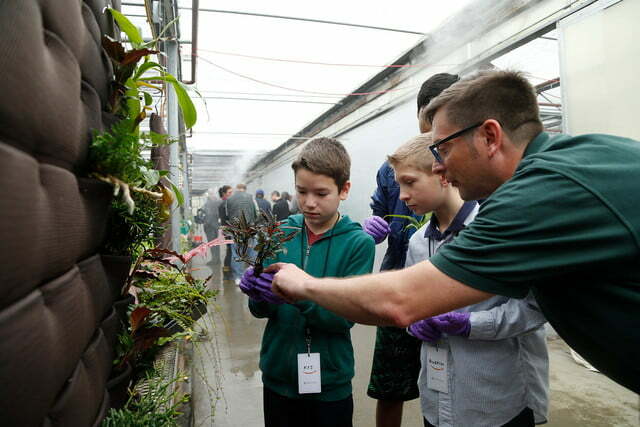 (Think begonias, orchids, and aloe plants.) To mimic these conditions, the Spheres use radiant floor heating and cooling, ventilation to simulate breezes, and infrared-blocking glass. The temperatures will average around 72 degrees Fahrenheit during the day and 55 F at night. Evening visitors might want to prepare for frizzy hair, when the humidity levels rise from 60 to 85 percent. 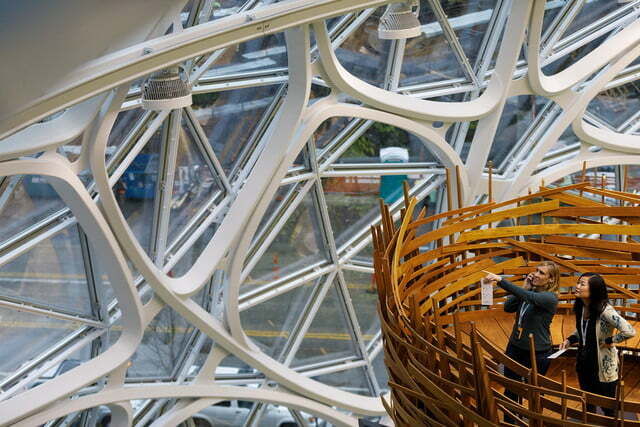 About 800 people can wander the Spheres at once, according to Bloomberg. 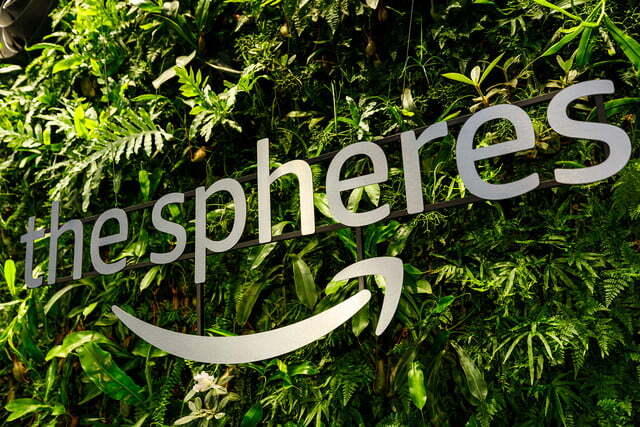 Employees will use their badges to gain access, and this will help Amazon keep tabs to make sure no one holes up in the meeting spaces all day long. The badged-entry nature means the Spheres aren’t really open to the public. 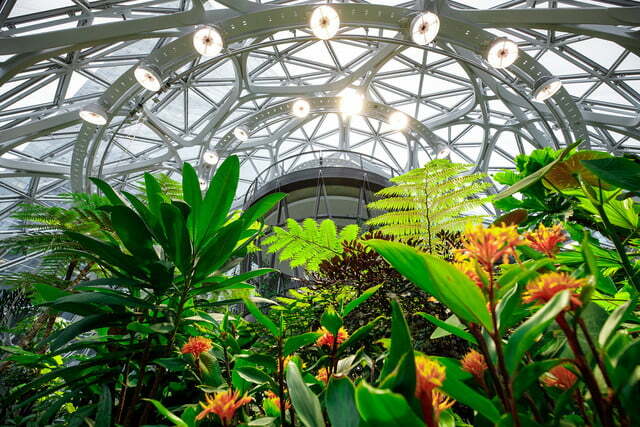 There’s an area for non-Amazonians to explore by appointment only, and visitors can see inside during the company’s biweekly headquarters tours. Seattle residents are also welcome to bring their pups to the outdoor dog park.